Delivering programs to help every family and community thrive! Learn about our health coaching and lifestyle management programs. Learn our best practices for health coaching programs for individuals and groups, and our methods for delivering events in the local community and online. Are you a fellow health professional? Sign up for one of our upcoming training sessions or webinars. We'd love to meet and support you! Download a FREE copy of our latest guide! You'll have a step-by-step roadmap to empower your attendees and make a bigger impact at your next event! 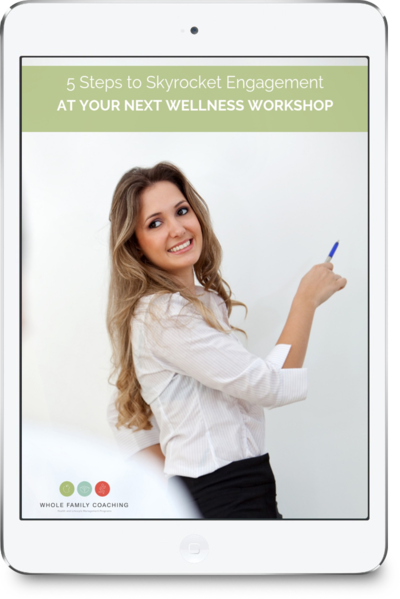 Get our free "Guide to Planning a Wellness Workshop," the ultimate planning tool for serious workshop leaders.